Biggs here! 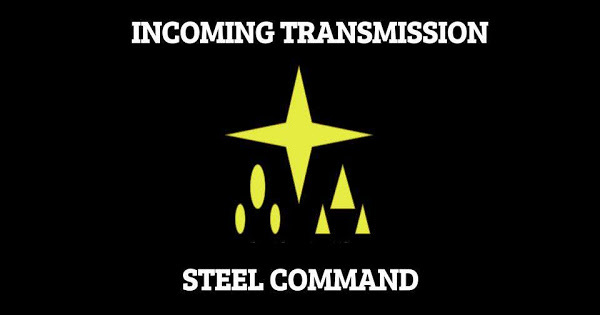 With the release of Legion on Thursday, it's time to get into the game those of us at Steel Command are most excited about. I'm going to be covering some of the basics of the game, then I'll be getting into the units themselves, not unlike the Commander's Guides for Armada. Truthiness and Shmitty have been talking about doing battle reports for their games, as well as general impressions of the game. Shmitty may join me in talking about core mechanics as well. Well, without further ado... let's talk about Orders! Each of the six rounds of Star Wars: Legion are divided into three parts: Command Phase, Action Phase, and End Phase. During the Command Phase, each player selects one of the Command Cards from their hand, and places it face down. Then both players reveal the card. These cards do three different things, and it's worth taking the time to go over each one. The first, and most obvious, is that the cards determine the "Priority" for the round. In other words, they determine who will go first. Anyone that has played Armada will know that being able to go first in a round is a major advantage. This is calculated by looking at the "pips" at the top left corner of the card. The player with the fewest pips has "Priority". In the event of a tie, the player with the Round Counter (Blue Player on Odd rounds, Red on Even rounds) rolls a Red defense die and takes priority if a "Block" is rolled (50% odds). If a player cannot play a Command Card (i.e. they have no Commanders left on the table) they lose priority to any player that did play one. Second, the cards allow you to assign face up order tokens to specific units within your army. It should be noted: you don't need to activate those units first as you always have the option of drawing a random token from your order pool during activations. By assigning order tokens you remove them from your random token pool, and thus determine exactly when you want to activate that specific unit. What specific units (and how many units) can be issued an order is listed directly below the card art. Finally, the cards can give a special effect for the game round. This could theoretically be anything at all. This is listed directly under the "units" section. 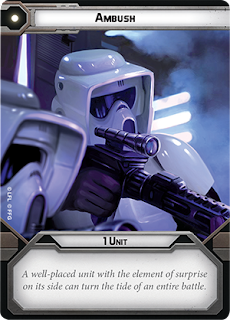 Most of the generic cards do not have a special effect, except for Standing Orders. After orders are issued based on the card you selected, you take all of your remaining order tokens (one per unit you have) and put them into an "Order Pool" from which you will draw random order tokens when you want to activate something that does not have an order token already assigned to it. You build your hand of Command Cards as part of your army building process. You have available the three generic Command Cards with 1-3 pips, plus the cards of the up to 2 commanders you have included already in your list. So, if you want to play with Luke Skywalker's command cards, Luke better already be in your list. Unfortunately, you can't play around with your priority chances, as you have to select 2 cards with 1 pip, 2 cards with 2 pips, and 2 cards with 3 pips, as well as Standing Orders (4 pips) for 7 cards total. What you can play around with (once more Commanders are added) are which units each card can activate and what the special abilities will be. Also, assuming you take 2 commanders, you can play around with which commander is capable of activating the units in question, as if you have a General Organa Command Card, you can't have Luke activate the unit. It should be noted at this time that the generic cards are not commander specific, and you can choose either of your two commanders when issuing orders (but only one commander per round). 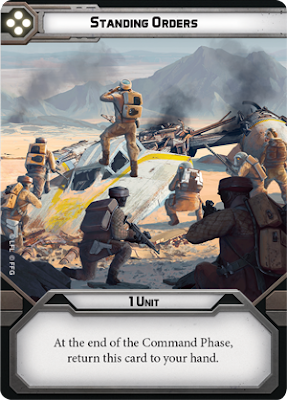 It's not worth the time to go into detail on the Commander specific cards, as we'll talk about each one in depth in the Ground Commander's Guides for that unit. But let's take a moment to look at the generics quickly. 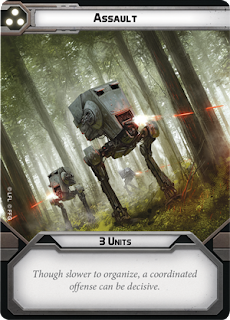 Ambush is likely to find its way into most lists that take a heavy hitter like an Airspeeder or AT-ST that needs to be activated first in a specific round, because it lets you issue an order to ANY unit, while all the one pip cards that have been spoiled thus far only issue orders to the specific commander. It can also be useful to spend to issue an order to a specific unit to remove it from the pool, making the pool less random, when you do need to go first with a different unit out of command range, though with just a single unit receiving a command it isn't really making the odds that much in your favor. Coordinating 2 units that aren't troopers. Probably the weakest of the generic commands. 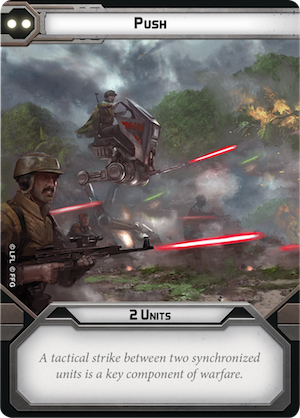 It does have some utility over the other revealed 2 pip command cards (both are 2 Troopers - we haven't seen Veers or Leia's spoiled yet). It won't get you Priority unless your opponent is using a 3 or 4 pip card, and it isn't activating enough things to take all randomness out of the command pool early in an engagement. Three pip cards seem to be giving up Priority for emphasis on being able to activate the right unit at the right time. Assault does this very well, with the added bonus of being usable by either commander in your army. Because you can issue 3 orders to any units you have, and you aren't forced to activate them first, you can use this to clear out your order pool to try and make it entirely non-random. After all, if the only thing in your order pool are Corps units, you know you are 100% sure to draw a Corps order token when you need to activate a specific Corps unit. So when you plan an Assault, try to have your commander assigning tokens to units that will clear their tokens from the pool, like the Commander themselves (max 2) or Heavy units (max 2). Then you've taken all the randomness out of your turn, at the cost of probably going second. The best part of real life standing orders is not having to ask permission for what you were going to do anyway. You already have to take this command card, probably so you have something to do when General Veers dies in Round 3 after you've dropped all 3 Vader cards. But it IS useful. This is the unsung hero of cards. A lot of emphasis is usually placed on going first in a game round, but sometimes you are best served by being the last person to activate rather than the first. Set up a good defensive position and let the enemy come to you. Force them to stumble into your trap. While this might not be as amazing as in Armada with mandatory movement (though some units have a Compulsory Move) this order lets you pick a specific unit and know you won't have to accidentally activate them too early. And if you know you have the same number of activations as your opponent, this can give you the "last" activation that will let you potentially "last / first" them with a 1 pip card next turn. And you can use it the first turn, without burning something useful, because it goes back to your hand when you do use. On a short edge deployment scenario, is there any way Standing Orders isn't an autopick? Leia or Veers has a LOS on something on the other side of the map, and you want a free round of softening 'em up?